"American Idol" host and general jack-of-all-trades Ryan Seacrest just invested $1 million in his new iPhone attachment startup called the Typo Keyboard. 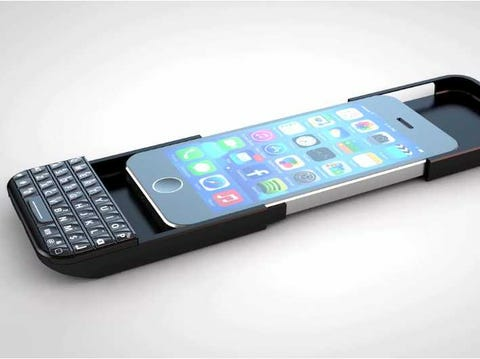 Just slip the keyboard onto your phone like a case and start typing away as if you had a BlackBerry. The Typo launches in early 2014. Seacrest co-founded the company with Show Media CEO Laurence Hallier and the duo expects to invest more than $5 million to continue to create variations on the attachment, according to AllThingsD. The idea originated because apparently Seacrest (and all his friends) used two phones: One with a keyboard for typing and correspondence and an iPhone for virtually everything else. After trying out and hating other keyboard models on the market, Seacrest and the team spent two years developing Typo. You can pre-order it for your iPhone 5 or 5s for $99. TYPO PRODUCTS - iPhone Keyboard Case from Typo on Vimeo.